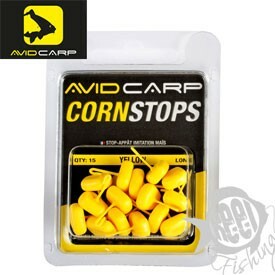 Corn Stops Now Available As Floating Corn Stops Corn-Stops will add a vibrant colour sighter to almost any rig even Pop-Ups attracting more are more fish towards your hook bait.No more will you need to use a normal dumb bell hair stop these unique stops have a little plastic hook which when is looped on to a hair rig is easily pulled in to your bait leaving you with a fantastic hook bait arrangement. Corn-Stops come in to different sizes enabling you to adjust the hair if you choose to use a different size bait without changing your rig. Available in short and long stems, quantity 15 YELLOW AND MIXED COLOURS. Looking to buy some Bait Components as part of a fishing gift? If you would like some advice on purchasing Bait Components, simply contact our expert fishing team, giving us either an email or phone number on which to contact you and we'll get back to you right away with the best advice and prices. FREE Delivery on all Avid Bait Components over £100!! !